The twenty second day of February 1949 had been a typical late summer's day on the NSW South Coast. At about 3 o'clock a southerly buster had passed the Wollongong area and the sea conditions had dramatically changed for the worse. Since then the ship had battled the deteriorating seas, first in an attempt to reach Sydney and then in a battle to make the safety of Port Kembla. By 10.00 pm it was only four kilometres away from safety when suddenly the list on the ship worsened. Within minutes the ship had "turned turtle" and sank, taking four crew to their immediate death. So went the last minutes of the SS Bombo. The NSW Government owned State Metal Quarries at Bombo, just north of Kiama on the New South Wales South Coast utilised the services of a number of vessels for transporting blue metal from the quarry to Sydney. These included the SS Kiama, SS Helen Nichol, SS White Bay and SS Boambee. In the late 1920s, State Metal Quarries placed an order for a new vessel with H. Robb at Leith, Scotland. In late 1929 the 540 ton and 46 metre SS Bombo was launched and on 11 February 1930 she departed for Sydney under the command of Captain Manning. Since 1924, Captain Manning had brought six new ships out to Australia. The Bombo ran into heavy seas in the English Channel. The seas were said to be so rough that the crew could not get to the forecastle and had to spend one night in the mess room. The ship sailed via Port Said and Aden and arrived in Sydney via the Torres Strait on 23 April 1930. Although five days early, the ship was said to have been critically short of supplies when it arrived. 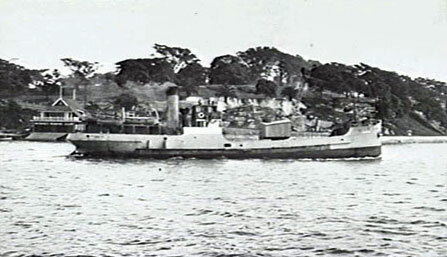 The Bombo commenced service transporting blue metal from the Bombo Quarry between Kiama and Sydney almost straight away under the command of Captain Arthur Bell, former skipper of the SS Kiama. In December 1935, together with the assets of State Metal Quarries, she was sold to Quarries Pty Ltd. The ship was averaging about five trips a week on the voyage. On 22 February 1941, the Bombo was requisitioned by the Royal Australian Navy and on 28 May 1941 commissioned as HMAS Bombo (designation BB), an auxiliary minesweeper. Two Oerlikon heavy machine guns, a 12 pound gun were installed and four depth charges carried at the stern. The 12 pounder was mounted on a bandstand on the foredeck. Some reports say she served between Sydney, Melbourne and Hobart until May 1944 and another says November 1943. During its time in Hobart (some time in 1942, exact to hopefully to come), HMAS Bombo intercepted the three masted barque Kaiulani (the last American merchant square rigger to double Cape Horn) in Storm Bay and towed her to an anchorage at the mouth of the Derwent Estuary for clearance. Of interest, the crew of the Kaiulani refused to work and were incarcerated for a few weeks under wartime aliens' provisions before being released on a writ of habeas corpus. The barque was then towed with crew to Sydney by the tug James Wallace and the rig cut down to serve as a barge in New Guinea during the rest of the War. 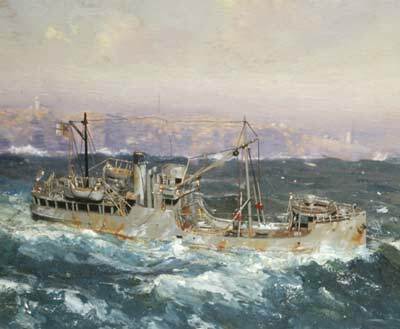 The Bombo was one of two minesweepers operating at that time from Hobart to Port Arthur in rotation each day. During early 1943 HMAS Bombo appears to have moved to Northern Australia, probably only temporarily (as you will see). It appears to have been used in the Northern Territory and Western Australia. She was reported to have been used towing targets outside Darwin Harbour and may have visited the islands of New Year (about 270 km north-east of Darwin), West Montalivet, Peron (about 100 km south-west of Darwin) and North Goulburn (about 70 km south-east of New Year Island). On 30 January 2007, Arthur Bell, 82 years old, of Mays Hill in Sydney phoned me. He told me that although he has the same name as the skipper of the Bombo in her pre and post war service, as far as he knows he is not related to him. Arthur told me that in 1943 when he was Wireless Telegraphist Arthur Bell of the Royal Australian Air Force 105 Fighter Control Unit, he did a voyage on HMAS Bombo. He was not crew, but had been collected from Wyndham in the Kimberley Region of northern Western Australia and taken to a little island called West Montalivet where they landed on 27 March, 1943. This is located about 330 km west of Wyndham (in a straight line) and about 40 km west of Cape Voltaire. He said that the Bombo had come from Darwin and was carrying a radar station for the 344 Radar Station. The station was assembled on West Montalivet and for the next nine months, Arthur was based on the tiny island. He said that many times they saw Japanese planes fly overhead, but none were on an attack mission, only carrying out reconnaissance. It appears that after this trip the Bombo returned to Hobart in Tasmania. In May 1943 HMAS Coombar, another auxiliary minesweeper, was undergoing slipping and repairs in Hobart. In a reference in some State Government documents mention that workmen started removing ballast from her on 17th May 1943 and her coal supplies were transferred to HMAS Bombo. It is not clear what the Bombo did after this but it seems that at some time the ship returned to Sydney. On a trip from Tasmania to Sydney she towed a concrete ammunition lighter (constructed during 1943-1945 by the Timms Bridge Construction Company in Tasmania). The Bombo was reported to have left Sydney in February 1944 and spent the next 18 months in Darwin and the Northern Australian area. It is reported that HMAS Bombo was converted into a stores carrier on 27 June 1944. 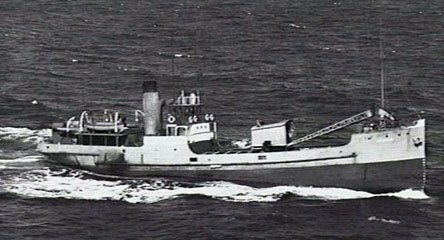 HMAS Bombo provided yeoman service taking equipment and stores to the remote Anjo Peninsula in WA. These were used to help construct Truscott Airfield which was started in late January 1944 and opened in May 1944. This is about 230 km in a straight line north-west of Wyndham Western Australia. This supports that she was removed from the Sydney, Melbourne, Hobart run in November 1943 and left Sydney in February 1944. Ken Kable (86 years old in 2012) told me that ht crewed on the ship when they were building Truscott. He said that they ran aground many times when up inlets in this area due to the big tides. He also said that the ship always had a list to port. The ship also was not real stable due to its flat bottom. She may have served in Papua New Guinea, but I am not sure of this fact. As mentioned, during 1944 and possibly part of 1943, it appears she was in Darwin a fair bit. Les Harper (see references - Iris Nesdale book) was based there during this time and he reported seeing the Bombo. He said "She always had a big list to port, which must have been a problem in heavy seas". As mentioned above, Ken Kable also confirmed this to me. On 7 September 1945 she was at Thursday Island off the tip of Cape York, the northern-most part of Australia. On 11 September 1945 the Bombo was part of a force that occupied Koepand, East Timor. This was led by HMAS Moresby. They were there for the surrender of the Japanese forces. Ken Kable confirmed this to me. In late November 1945 the Bombo sailed from Darwin to Sydney. The Bombo was paid off on 25 February 1946, returning to its owners on 25 July 1947. The Bombo's regular skipper, Captain Arthur Bell once again took control of her on the run from Kiama to Sydney. 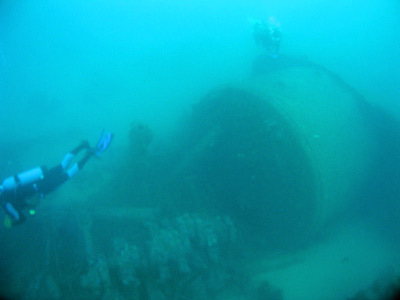 On about 10 September 1947 Captain Bell brought the SS Bombo into Kiama for the first time since February 1941. On 25 September 1947 she was reported to have sailed from Sydney for the North Coast but I think this was supposed to be the South Coast. It looks like it did a return trip nearly every day. On 29 December 1948, the Bombo grounded on the Kiama bar, suffering some damage. It was quickly repaired and returned to work by mid-January. It is said that at the same time she had a general overhaul, inspection and safety survey. In mid-February 1949 Percy Carroll had retired from the ocean and was living at Vaucluse in Sydney (near Vaucluse House). He had been the Chief Engineer of SS Bombo before his retirement. The regular Chief Engineer was either on leave or ill and he rang Percy and asked him to fill in for him on the Bombo. At 11.55 am on 22 February 1949, the Bombo left Kiama for Sydney with about 640 to 650 tons of metal aboard. 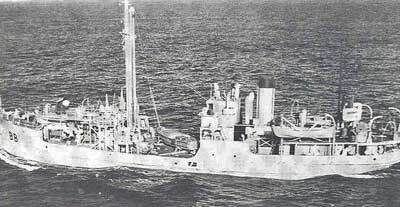 This was distributed with 380 tons of 1/2 inch metal in the aft hold and 260 tons of 3/4 inch metal in the forward hold. Among the 14 crew was one Thorvald Thomsen who almost 30 years earlier had survived the wreck of the SS Tuggerah and was lucky to be absent ill when the SS Myola sank a few weeks earlier than the Tuggerah. Also on board was Percy Carroll. Just off Port Kembla, a southerly change hit the vessel turning a pleasant day into a nightmare. At 4.00 pm when four miles (6.5 kilometres) north of Stanwell Park, a huge wave went right over the ship causing a 5° list to port as the cargo shifted. Remember Les Harper's comments when he saw her in Darwin during the War ("she always had a big list to port")? Captain Bell decided to make a run for Port Kembla Harbour where the Bombo could shelter while the blue metal was retrimmed. At 5.00 pm a message was sent to the coastal radio station at La Perouse that the Bombo had turned around and was head south for Port Kembla Harbour (which is a few kilometres south of Wollongong city centre). 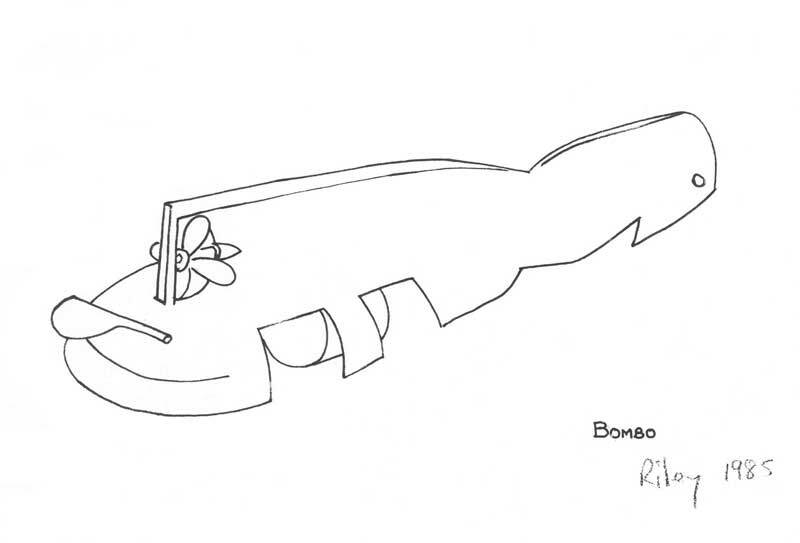 The Bombo was going at a very slow three knots. At 9.30 pm she was three miles north of Wollongong Lighthouse and about three to four miles off the coast. Everything appeared to be relatively okay when all of a sudden the list increased to 30°. The Captain ordered everyone on deck and that the lifeboats be lowered. However, before this could happen, the ship turned over even more and everyone dived into the sea. As they watched, the list increased and the ship sank. The ship was less than three kilometres from Port Kembla Harbour and only 2.5 kilometres off the beach south of Wollongong Harbour. Ten men escaped from the ship, the other four going down with the wreck. 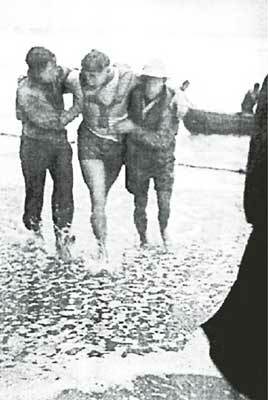 Thomsen was one of the survivors clinging to two planks. Two crew decided to swim to shore but they never made it. At dawn, Captain Bell and another crew member were dead, six still hanging on to the planks. The land was sighted and the remaining survivors decided to set out at 15 minute intervals for the shore. Lifesavers from Thirroul, Austinmer and Coledale launched a surf boat from Coledale in an attempt to search for the victims. However, they were rolled by the seas and struggled to shore, with one man, Norman Richards, knocked unconscious and saved from drowning by fellow lifesaver Bruce Smith. A dog, believed to be the ship's dog, was found on Bulli Beach covered in grease and sand. Thomsen and Fitzsimmons were of the view that the ship sank because the load of blue metal shifted. Percy Carroll's sons hired a couple of boats and searched the seas off Wollongong for a number of days looking for his body. Unfortunately, his body was never found. Percy's family never heard anything from the real chief engineer, no expression of sorrow, they never even sent flowers to the funeral. On Thursday 23 June 1949 the Royal Shipwreck Relief and Humane Society awarded a silver medal and certificate to Percy Ford and a bronze medal and certificate to G. Brown of Bulli for rescuing Thomsen. When the Bombo sank, a great deal of its cargo of blue metal dropped out of the holds and fell to the sea floor (remember the ship turned turtle). This pile of metal is now located about 50 metres to the east of the wreck. As the ship went down it ploughed into the sandy bottom bow first. This caused some damage to the bow area. Soon after, the bridge hit the bottom and then the great weight and momentum caused the ship's back to break and the Bombo buckled right across the hull almost in the middle of the ship. At the same time the weight squashed the bridge beyond identification. As she sank, some pieces fell and ended up on the sand next to the remains of the ship. This includes a hopper used to load coal/gravel and parts of the masts. Lying roughly north-south, the Bombo was now in water 32 metres deep and upside down almost in the middle of the shipping channel. 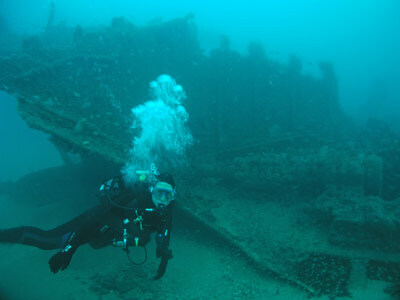 The wreck lay undiscovered by divers until 1978, Don Morrison and his mate Bruce Hammond were directed to a location by a couple of fishermen who fished this spot regularly. They did not know what was there but it was a good fishing spot. Don and Bruce dived on the spot and thereby discovered the wreck of the SS Bombo. It was further south than expected as the reports from the surviving crew put it as being about five miles (eight kilometres) from Port Kembla. They dived it regularly over the next few years and took nothing from it (except a few bits and pieces, viz, one leather shoe, one pressure gauge and several light bulbs). The light bulbs were a fascinating find. Don reports that they were floating inside the engine room, the metal caps had corroded off, but there was a bit of filament extruding through on most of them. He actually got one to light up when he put power to it. In 1983 they made the location of the wreck known to the diving public. Don has told me that within months of making the wreck's location known, the Bombo was literally stripped of just about everything that could be removed. Don says that this was the most disappointing thing for him. Don reports that discovering the Bombo was certainly one of the highlights of his diving career. Don and Bruce corresponded with the Navy Hydrographic Dept at the time of the announcement. They were very grateful for the location of the wreck and they sent Don the first hydrographic chart produced showing the location of the Bombo. 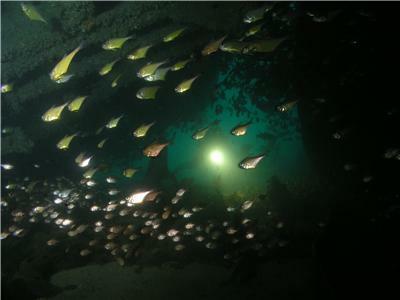 Nowadays, the Bombo is an excellent dive for the experienced diver. The attached marks, as well as the local dive operators, will generally put you on the wreck in the vicinity of the stern. The wreck's approximate location by GPS is 34° 26' 46.5' S and 150° 55' 28.8' E (note that nearly all my GPS Readings are using AUS66 - if you use any other datum, you will need to convert the reading - see my GPS Page for more details). You should also note that before you attempt to dive this wreck in your own boat, you will need to do some work. The wreck is located almost right on the approach path to the Port Kembla Harbour. As such, huge ships pass right by the wreck, very close indeed. In recent years, the harbourmaster has insisted that boats are not permitted to be at anchor when ships are entering or leaving the port. Although you do not need a permit, you need to check that there is no ship entering or leaving during the time that you are planning to dive. You can do this by going to the port authority's web site and selecting the shipping movements page and scrolling down to the day(s) you are interested in diving. This will show the anticipated shipping movements and you can plan your dive accordingly. 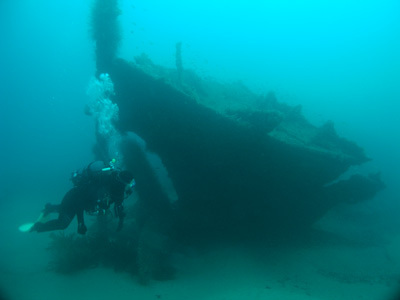 Then, on the morning of the dive day, you will need to phone the duty officer on 4275 0159 or 4274 4571 and check to see that it is still all clear to dive the wreck. 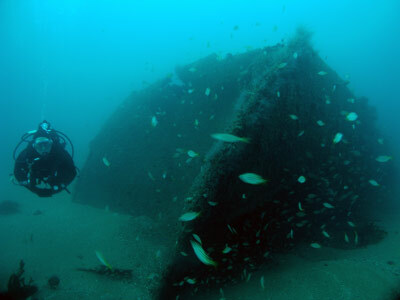 For almost 48 years until late August 1996, the wreck of the SS Bombo lay upside down on the seafloor, almost fully intact except where it broke in half when it sank. However, a huge storm on Saturday 31 August 1996 (I think) caused considerable damage to the wreck. However, as strange as it may seem, the damage has made the wreck a far better and more interesting dive. The photo at left shows the prop in January 1992 when it was upside down. More recently there has been some damage to the bow. This occurred in late 1998 or early 1999 and some even more recently. More about this later. 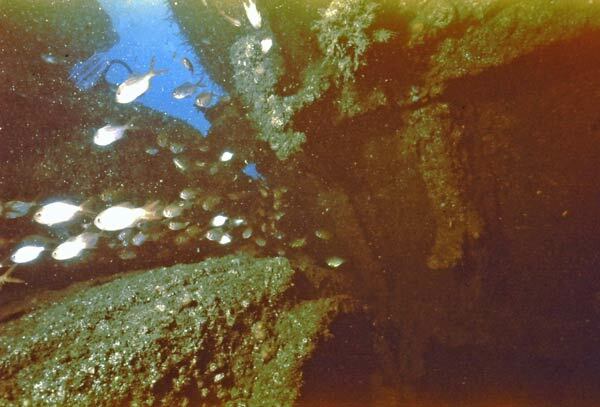 As you descend to the wreck (if you are anchored on the stern - which is likely as this is the only place anchors will easily take hold), you will see either the open engine area and boiler or the broken stern section. What has happened is that the section of the stern hull, from just behind the front of the boiler right back to the stern itself has broken off and is now sitting upright on the ocean side of the rest of the wreck. The prop is still attached to the broken away stern section but is now the right way up. One of the blades of the propeller broke off during the storm and is very obvious. 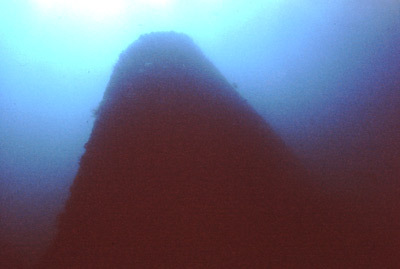 NOTE: The above four underwater photographs were scanned in 2011 from slides taken in 1992 using a Nikonos IV-A. The main section of the wreck looks as if someone has used a giant can-opener and cut the side of the hull about 0.5 metre off the sand. The engine is now freely accessible (although upside down of course) with the steam engine's pistons, conrods and driveshaft visible as well as the donkey boiler on the eastern side. You can still enter the area in front of the boiler from either side and examine the boiler in detail. The area in front of the boiler is now more open than before. 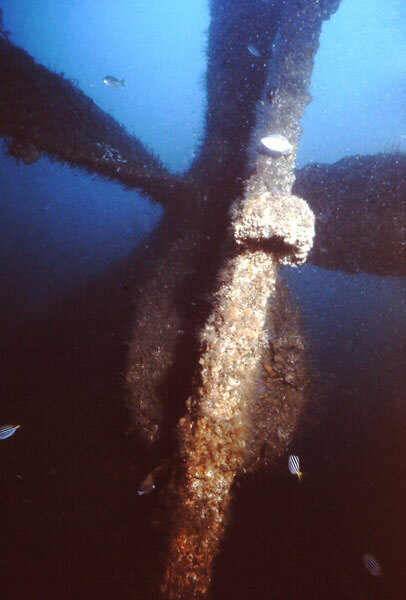 The rudder still sits on the sand right at the stern (behind the engine) where it fall when the Bombo hit the bottom in 1949, although it has sunk a bit into the sand since 1997. Head north along the eastern side of the wreck and you will pass the broken hull area. On this side the sand used to cover the hull for a only a few metres but now the hull is flatter and in 2016 it is covered for 15 or so metres. Past here the hull has dropped considerably from when I first dived it. It is opened up for a few metres giving an access to the inside of the Bombo. This section was almost intact till 1998/99 but now the hull has broken a few metres off the sand and as mentioned, the main section of the hull has dropped right down. In 1999 you could still swim from this spot right across the bow to the western tip of the bow but it was quite low and cramped (it used to be open and large). You really cannot do this now. I stated back then it was only a matter of time before the whole section collapsed flat. In 2002 my friends dived the wreck (I was sick and looked after the boat) and they informed me that you could not really enter the bow. In April 2003 I dived the wreck and it sure had changed, you certainly cannot really enter the section first mentioned above other than stick your head inside. I dived again in May 2005 and it is even worse. Forward from here the hull has now buckled quite dramatically. It now comes off the sand and does an S-shaped bend. In the first section, you can look into and enter the hull for a short distance. Head to the bow and see the damage caused when she hit the bottom. There is now also a lot more damage on the eastern side. Return to the stern on the western side. A few metres south from the bow you will see an opening. This used to give access to the hull and you could swim right across to the eastern side. However, you can really only go inside for a few metres now whereas you used to be able to explore the whole inside of the hull and exit on the other side (I once found a mask deep inside here!). A few metres further on there is another access hole and again you cannot really enter far (even when the hull was in good condition you could not). Keep going and along the way you will see a hopper and a bollard, as well as what appears to the part of a hatch cover, a few metres off the wreck before again passing the broken hull section. Examine the damage caused when she broke her back. There is a sand patch about seven metres long here before you see the wreck again. When you return to the stern, you may still have a few minutes to kill before ascending. 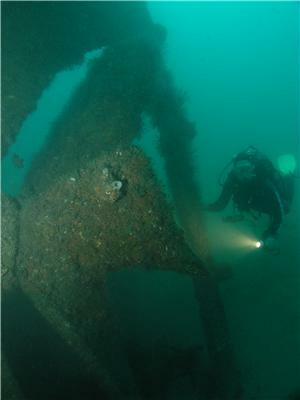 Have a look at the bits and pieces on the western side of the wreck before checking out the top (bottom) of the hull. This should enable you to travel straight to the anchor line. This is a square profile dive, with an Aladin Pro dive computer allowing about 17 minutes bottom time. The visibility can be quite varied, often not matching the apparent sea conditions. It is probably best done on an incoming tide, although most times the tide will not be relevant. This is another great dive for the experienced diver. 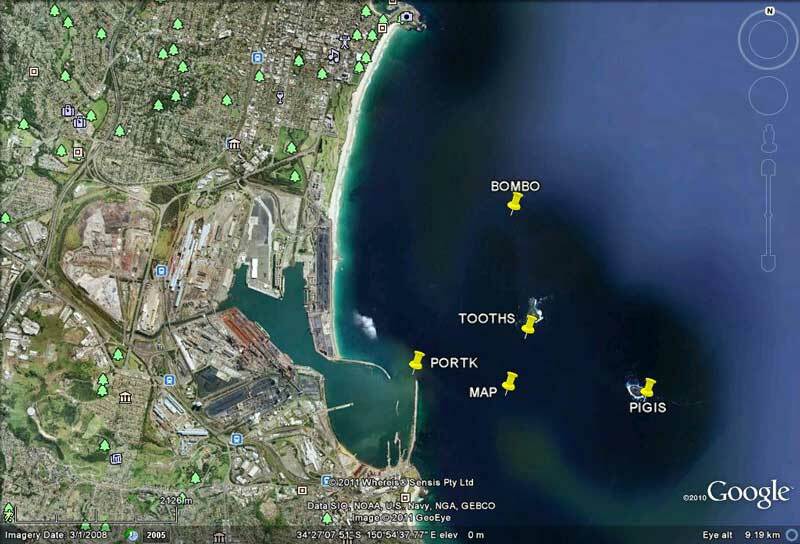 For more details about diving the SS Bombo, contact United Divers Wollongong, check out the Yellow Pages Web Site for contact details. There is reported to be a memorial at Kiama to the ship and her crew, but I have never seen it despite visiting Kiama many times. After Captain Arthur Bell died, his family donated a trophy to the Concord and Ryde Sailing Club in his memory and it was known as The Captain Bell Memorial Cup. This trophy was presented each season for the VJ class in until the mid-1970s when VJs were no longer raced. It now resides in the Club's Trophy case. The Vanished Fleet of the Sydney Coastline by Max Gleeson, pages 145 to 154. Lloyd's Register 1930-31, 1937-38, 1948-49. Australian Warships of Second World War, page 174. Scuba Divers Guide Southern NSW Coast by Tom Byron, pages 102 and 103. Email from Rex Cox, rexcox@netspace.net.au.